Viktor Yanukovich, who was ousted as president of Ukraine in a violent armed coup, says history will not look kindly on those who ceased power in 2013, because they secured their authority by spilling innocent blood. Yanukovich, who currently lives in exile in Russia, spoke to RT after a Ukrainian court questioned him via telelink about his part in the Maidan protests, where over 100 people, both protesters and police officers, were killed. The legal proceedings come three years after a mass protest in Ukraine triggered monumental changes in global politics. 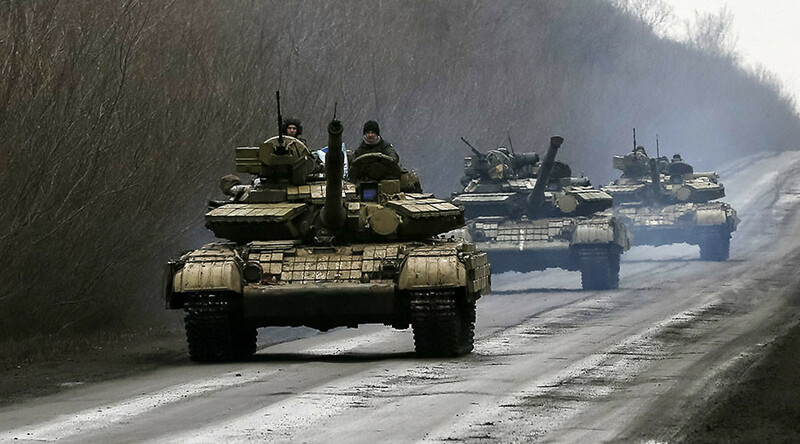 In the interview, the ousted leader accused the new authorities of unleashing the national army on the rebellious regions in eastern Ukraine, which has resulted in a civil war that has claimed over 10,000 lives so far. RT: Thank you so much for your time. Could you share your opinion of the current Ukrainian government? I mean, how long do you think it will last? Another thing we’d like to ask you about is the so-called Saakashvili factor in Ukraine. What’s your take on that? V.Y. : Well, let’s put it this way. 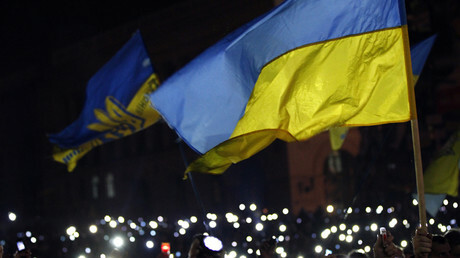 The opinion polls now show that the level of trust Ukrainians have in their government is at its lowest – around 80 percent of the population distrust their authorities. That, however, doesn’t mean that this government’s days are numbered. Why is that? It’s because people are lost today, I mean the voters. They are so confused by what’s been happening over the last three years that they are not ready to make any big decisions. That means that those in power will continue playing their games in the Parliament for a long time, but I’m not ruling out a scenario in which they choose to start correcting their mistakes. It’d be a miracle, but it might happen. Personally, I don’t believe in it much. Why? Well, look at the court proceedings. On November 25th, [the authorities] didn’t even manage to bring the accused to court [because radical protesters] obstructed the proceedings. Today they fired the head of the State Penitentiary Service. They fired him, simply because he followed the court’s orders and brought those guys from the Berkut riot police units to the court where they are being tried. Their steps are just unpredictable, like Prosecutor General Lutsenko showing up in court today. That was just another of their unpredictable actions. So what can common people expect under these circumstances? I don’t think they’re brimming with enthusiasm. RT: What would you have said to Prosecutor General Lutsenko if he had publicly accused you of high treason? V.Y. : You know, in that case, I would have said that he had failed to reach the right conclusions back when he was in jail, that he hadn’t learned his lesson. I was asked today whether I regretted pardoning him, but I don’t regret it. I sympathized with him and his family, and this foolishness that landed him in jail, as I call it, it wasn’t worth being sentenced to prison for. But he was convicted and sent to jail. Whether the court made the right decision or not, the factual basis of this case... He was a minister in my government, you see, and I saw how much his family was suffering. There was a commission on pardons that recommended me to pardon him, which I did, of course. RT: Let’s go back to Saakashvili. How do you see the Saakashvili phenomenon? V.Y. : [laughs] What a vivid imagination you have! Well, Saakashvili is a very notorious figure, I would say. Every political event he has played a role in has been very dramatic, like the Rose Revolution in Georgia. By the way, Mikhail Saakashvili used to work with ousted president Eduard Shevardnadze, may he rest in peace. His appointment in Ukraine was also a risky enterprise of sorts, a risky decision taken by both him personally and the authorities. He’s also very unpredictable. As people say, they are all very alike. Now they have these disagreements – I don’t know what is it they can’t agree on – but I think it means that Saakashvili’s masters in the US gave him some kind of a sign. There’s a proverb about rats abandoning a sinking ship, so he and his team set off right away, right on the mark, like Olympic champions. If he is willing to stay in Ukrainian politics in any capacity, and he has already publicly confirmed that and even started to take certain steps, well, we should be expecting some new headline-making moves on his part. That is quite possible. On a number of occasions when he gave his own view on the current authorities, I found myself thinking… well, he is right. It is surprising, yet nonetheless true. He is still young, quite young, and who knows, if he learns some lessons, and life teaches all of us lessons from time to time, probably, he will come in handy in one way or another one day. Only time will tell. In any case, all his risky undertakings have brought no good and were never really welcomed by the people, I should say, and certainly his escapades have not been beneficial to society in any way at all. Look at Georgia. The situation there is rather complicated. A lot has happened there recently, and he was involved in one way or another. All these developments have been quite controversial. RT: Are there any grounds for the accusations against the Berkut unit? V.Y. : There are absolutely no grounds. What abuse of power are they being accused of? Recalling November 30, well, maybe they should have been a bit easier on the protesters, but the Berkut riot police were simply provoked to act – there were fireworks thrown at them. It was almost a real attack on police officers. What the police perhaps should have done was detain the protesters and send them to a pretrial detention center. Instead, the police might have smacked them around a bit too much, but the fact is that there were absolutely no students among those detained, mostly radicals, as was found out later. This also raises another question: “Why have the authorities conducted no investigation and failed to establish any facts?” We haven’t got any answers to these questions so far. I personally think that the Berkut unit accomplished a very difficult and most challenging task to protect the rights of people and uphold law and order in Ukraine in an extremely dangerous environment, and they certainly deserve the greatest respect. The authorities should not be treating them the way they are now. You might remember an incident when several policemen died when a grenade was thrown at them outside the Parliament. Poroshenko then awarded them with Orders of Courage. But the policemen in the dock are no different, just like those who died and those who were severely injured during the Maidan protests. They all deserve words of encouragement and respect. I think that they are not being treated fairly. One of the reasons that made me go to court as a witness is the very treatment they, the Berkut officers, are receiving. 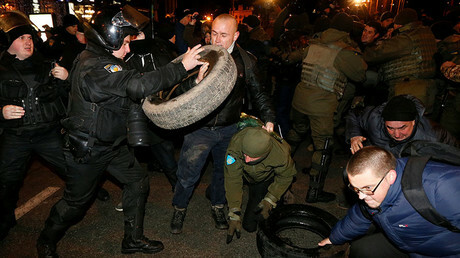 Look, following those events, the riot policemen didn’t run, but stayed in Kiev. They had all been living peacefully before they were rounded up and charged. If they felt any guilt, why would they be living in Kiev? They would have simply left the city. Otherwise, it simply doesn’t make any sense. I wish justice would finally prevail for the Berkut unit and other law enforcement officers. RT: Would you agree to face-to-face questioning with President Poroshenko? V.Y. : Yes, and not only with him, with all the Maidan activists. RT: What would you tell him if you met? V.Y. : First, we know each other well enough. Second, it would be one thing in front of the cameras and an absolutely different thing if there were no cameras at all. It would be a serious man-to-man conversation. One should always remember that no victory can be achieved without losing. Burning bridges is never an option in politics, never. Such outrageous actions can have really bad consequences. I never took the liberty they afforded – to unleash war on an entire region, running people over with tanks and using artillery, and for what? For not liking you or treating you somewhat below par? Or having an opinion of their own about their future? This is wrong. If you take the history of any country, it never ended well for those who came to power through bloodshed. No amount of power is worth spilling even a drop of blood to obtain. That’s my fundamental principle, but they chose a different path. And one last thing I’d like to say. Recently, when the government is asked questions, especially questions on the Minsk agreements, like when are they going to adopt the amnesty law, they say, “we’re still thinking about it.” But I know what those in the inner circles are saying internally: there are voices – and they are getting more and more persistent – which are arguing that the amnesty law must be adopted and that they should use this chance because they need it just as much as the Donbass fighters who are defending their land. So they need to think, and think hard. 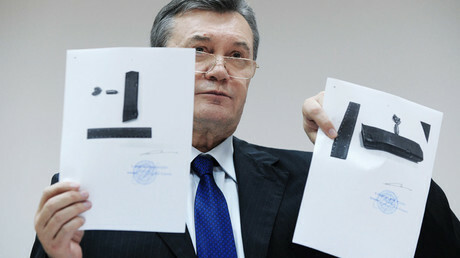 RT: Thank you, Mr. Yanukovych.